When shipping by ocean, the most common units of measure are Cubic Feet (Cu Ft or CU FT) and Cubic Meter (CBM). Calculating volume is relatively simple. 1 cubic foot is 1728 cubic inches. Volume in CU FT is calculated using the formula L x W x H / 1728. Determining what and how much you want to ship can sometimes be a difficult process. Cost is the primary determinant for a majority of shippers and rightfully so. Less than a Container Load (LCL) shipments are meant for smaller size cargo. Your LCL shipment will share container space with other LCL shipments and therefore, the cost to you is less than what you would pay for a full container. Let’s say you want to ship only a few boxes, maybe a large LCD TV and perhaps just your couches or mattress. It would make economical sense to ship as LCL in that case. On the other hand, if you know that you want to ship all or most of the furniture in your home and clothes, kitchen items, books, toys, tapes, etc then you want to think about FCL. If you are not sure, do let us know and we will give you our LCL rates and FCL rates. The LCL rates are usually based on charges for minimum volume and then charges per cubic feet for every cubic foot in excess of the minimum volume. FCL rates are based on container size and either a flat rate for pack and load or hourly charges based on actual item spent. We provide a break-up in terms of packing and loading charges (including materials), door-to-door transportation and destination charges. Tip # 1: LCL rates work out to be more cost effective as your volume increase. Contrary to what one may expect, you would not pay twice or four times more if you LCL volume increases by two times or four times. See the below line chart showing shipping cost in Dollars as your volume increases from 35 Cubic Feet onwards all the way until 1000 Cubic Feet. * Door-2-Door Shipping Cost – This is an approximation for purposes of education and not intended to be used for estimating your final shipping cost. Please refer to our quote that includes shipping charges based on your specific origin city, destination city, all inclusions, and exclusions and has rates for optional services such as packing and insurance. Tip # 2: If you also have FCL rates from us, you will also see from the above line chart that LCL makes economical sense as long as your volume is less than 600 Cubic Foot. If you have more than 600 Cubic Foot to ship then you are better off taking a sole use 20’ container. 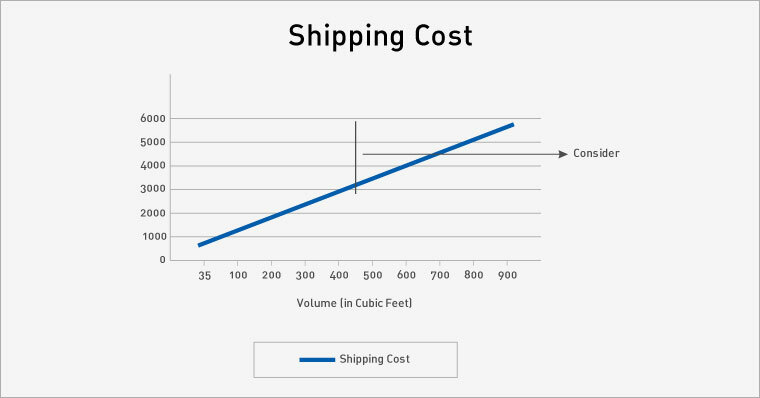 Tip # 3: As highlighted in the below picture, the sweet spot where you get the most bang for your buck is when you ship between 100 Cu Ft and 600 Cu Ft. To better understand this you can also look at the below line chart that shows your cost per cubic foot as volume increases. 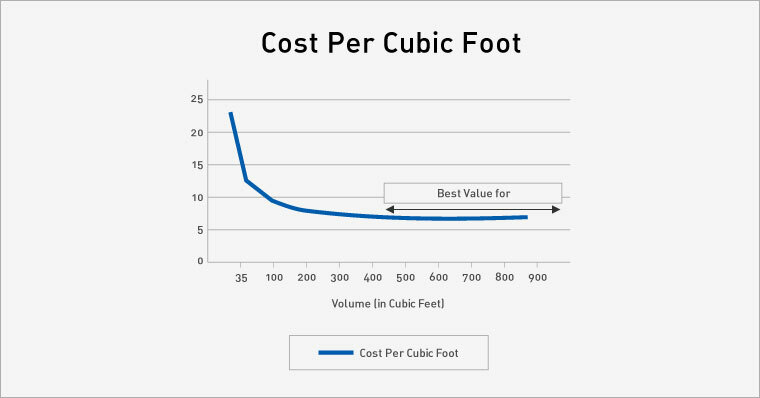 You will see the sharp decrease in cost per cubic foot as your volume increases beyond 100 Cubic Feet. This is because LCL shipping has fixed costs that any shipper needs to bear regardless of volume such as pickup & delivery costs, customs filing, documentation, processing, etc. You start deriving the real value for your fixed spend if your volume exceeds 100 Cu Ft.
Here’s a simple example that will help you relate to the point we are making… if you ship just your TV you will pay approx $850 for it but if you ship your essential small to medium sized items that you know you want to take such as clothes, books, toys, kitchen items and perhaps a home theatre; then the same LCD TV will only cost you approx. $250 to ship.. You may want to re-evaluate this before putting your TV for sale on Craigslist. **Door-2-Door Cost per Cubic Foot – Again, this is an approximation for purposes of education and not intended to be used for estimating your final shipping cost. Please refer to our quote that includes shipping charges based on your specific origin city, destination city, all inclusions, and exclusions and has rates for optional services such as packing and insurance. We recommend that you go over the subsequent questions pertaining to container sizes and volume estimation to determine what and how much to ship. Remember that whether you ship via FCL or LCL, estimating the volume you want to ship is the key to avoiding ‘cube shock’. ‘Cube shock’ is referred to as surprises/shock received on seeing the final gross volume. This could mean charges due to additional volume in addition to what was planned/budgeted in case of LCL or it could mean inability to fit your items in the container during loading and having to throw/give them away. Either way it is not a situation you want to be in and can be avoided with proper planning and having realistic expectations. Find out the weight/measurement of what you plan to ship BEFORE you go ahead. This includes doing the math: writing down the total OUTSIDE dimensions of your cargo. Write down all your information including the exact three (3) dimensions and approximate weight of every piece, every case, box, barrel, pallet, crate, or other shipping unit being used for the goods. Know how to calculate volume in cubic feet and cubic meters. 1 cubic foot is 1728 cubic inches. Volume in CU FT is calculated using the formula L x W x H / 1728. 1 cubic meter is 35.315 cubic feet. One quick and easy way to measure volume if you are only shipping boxes is stack the boxes on top of each other in generally square shape in a corner of your room and take the total outside measurements. Let us know if you would like for us to do a pre-move survey. We do pre-move surveys in most locations for FCL shipments and in some locations even for LCL shipments larger than 300 CU FT. Here are some items that are typically found in a house as we perform a pre-move survey. You can use this information to calculate your net volume. Anteroom : side table 5 Cu Ft, umbrella stand 4 Cu Ft, small mirrors – pictures @ 1Cu Ft each, coat rack 7Cu Ft, side chair 7 Cu Ft, arm chair 12 Cu Ft, round wood table 15Cu Ft, table lamp 5Cu Ft, small lamp 2Cu Ft, standing lamp 6fct, misc papers – packed into book cartons @ 2Cu Ft each, decor – packed into dish pack carton 6Cu Ft. Kitchen : med. table 15Cu Ft, 4 med. chairs 20Cu Ft, pail 5Cu Ft, average dishes into 2 dish packs 12Cu Ft, ave. pots/pans- misc sm. appliances into 3 linen cartons 12Cu Ft, stools 5Cu Ft, misc food/spices into 4-5 book cartons 10Cu Ft.
Children’s Bedroom(s) : crib 20Cu Ft, changer 15Cu Ft, plastic stools – toys – stacking units average 20Cu Ft, pampers & infant supplies ave 30Cu Ft.
Just for context, adding the volume of all these sample items comes to 2,140-cubic feet. One completely full 40-foot container-load. LCL shippers, please note that big items such as mattresses of furniture cannot be stacked on pallets. Write down a list of items you want to ship and send this information to us so that we can give you a firm, realistic estimate. LCL shipments are unlike an entire “exclusive use” ocean container, where it is possible fill it up with as much – or as little – cargo as needed. LCL shipments are measured, and the cost for international transport is based on how big or how small the total measurement actually is. If you decide to add items to your LCL shipment, it will affect the final gross dimensions that are noted after all the goods are packed/palletized (and crated) for export. We recommend that you be deliberative in what you plan to take with you; travel light if necessary. Separate the “superfluous items” from those to be definitely shipped. Consider: is it really necessary? If you are not sure if you should “take it or not?”, feel free to let us know and we will help you. Be sure to send us an email with your list and any questions. Remember: We cannot guess at what you plan to ship. We need for you to give us the information. Hopefully correct information. If your estimated volume is over 500 Cu Ft we recommend that you ask your sales rep for a FCL quote for side by side comparison. You can also ask for our FCL Shipping Guide that explains FCL shipping in detail. Palletizing is done for Less than a Container Load (LCL) shipments and the following should help you understand how palletizing is done and how best to optimize your box composition to keep volume overhead at minimum. A.If shipping large or medium boxes, ship in multiples of 4 for maximum space utilization. Different size boxes can increase the amount of unusable space. B.Each layer can have 4 large or medium boxes. This leaves unusable space of 4” on the short side and 12” on the long side of the pallet. If you are shipping small boxes, then each layer can have 12 boxes. It leaves 4” on the short side with the long side fully utilized. C.There can be max 4 layers of large boxes and max 5 layers of medium boxes in a pallet. D.Remember that the wooden pallet volume is 6 CFT (40”x48”x5”). 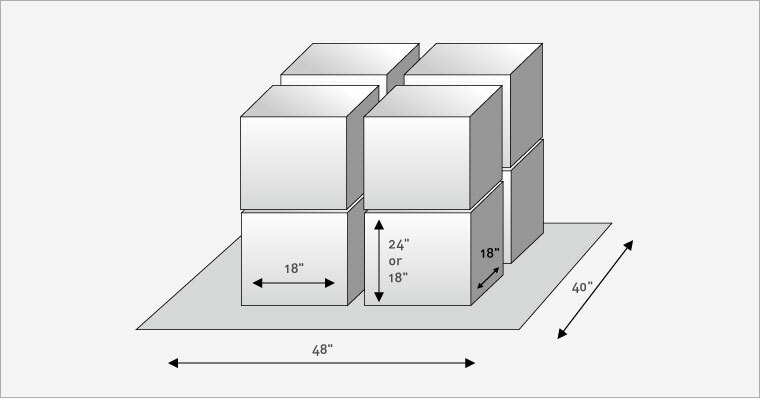 E.For large boxes, each layer of 4 boxes will be 27 CFT (40”x48”x24”). F.For medium boxes, each layer of 4 boxes will be 20 CFT (40”x48”18”). G.For small boxes, each layer of 12 boxes will be 20 CFT (40”x48”x18”). H.Heavier boxes are always placed at the bottom and lighter boxes on top. I.Calculate the cargo volume by multiplying the number of layers by the volume of each layer (depending upon whether you are shipping large or medium boxes). J.Add the pallet volume to your total from #9 above. This is your palletized volume. Our actual measurements should be within 10% of this estimate. 8 Large Boxes measure 60 CFT after palletizing (2 Layers) — palletizing overhead is 40%.